In a first in eight years, the Meadowlands this Saturday will host a handicapping tournament for 3 seats to next January's National Handicapping Championship (NHC) at Treasure Island in Las Vegas. The entry fee is $400 ($200 live bankroll, $200 entry fee) and walk-in signups are from noon-2 p.m. I caught wind of this NHC qualifier within 24 hours of returning to Jersey from NHC 17 and, immediately, a few questions came to mind, but primarily surrounding the Big M's motivation for returning to the thoroughbred handicapping contest circuit after such a long hiatus and potential to cannibalize New Jersey's on-track tournament circuit, now dominated by Monmouth Park. 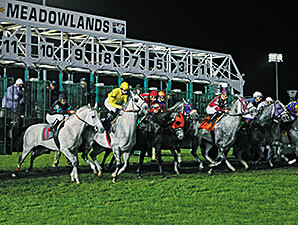 "The majority of our simulcast bettors are thoroughbred-only players and we wanted to give them a contest with a strong prize pool," emailed Rachel Ryan, Marketing Manager at Meadowlands Racing & Entertainment, which runs North America's top standardbred track and boasts five consecutive (live harness) cards surpassing $3 million of all-sources handle. Speaking of the prize pool, the $200 non-refundable entry fee will fund a cash-prize structure that, according to the contest brochure, will pay the winner 40% of the pool, then 20% for second, 10% for third, 7.5% for fourth, 5% for fifth and 3.5% each for sixth through tenth. The top 3 finishers, of course, also win the grand prize -- a berth to NHC 18, including the 4-night stay at NHC host TI (but not airfare). "We know all the major players want to play in NHC qualifiers for a chance to win a seat," continued Ryan, in her 12th year working for the Meadowlands racetrack. "Running a NHC qualifier just made sense. It would attract new players to our track and also get our regular T-bred players involved." The payout structure and format are not too different for those familiar with NHC qualifying tournaments at Monmouth Park, which postponed Simulcast Series Challenge #3 to February 27 to accommodate the Big M and remains the top NHC qualifying track in the U.S., with at least 25 NHC berths up for grabs on its 2016 handicapping contest slate. The biggest differences for NHC regulars who would otherwise have played the SSC tournament originally scheduled for this Saturday are the $20 minimum bet per race (instead of $10), the ability to make "show" wagers (Monmouth scaled back its SSC slate to just win and place; Big M is using win, place, show and/or WPS -- a plus, in my view), and using 4 simulcast tracks instead of 3. Saturday's tournament will feature Aqueduct and Gulfstream, but also Fair Grounds and Oaklawn Park, which according to Ryan produce the larger handles for the Big M. Plus, the Risen Star Stakes at Fair Grounds adds appeal as a Kentucky Derby prep with a deep field highlighted by the much-ballyhooed Mark Casse prospect Airoforce. After visiting the new Meadowlands last October for the first time to take in the thoroughbred turf meeting, I can attest to the quality of the facility itself and its aesthetic. The last time I had visited the Meadowlands before that was for a Horseplayer World Series contest at the cavernous and dank old monolith in 2011. The atmosphere was cold and the turnout small (less than 100 players). The new building, to the contrary, is absolutely gorgeous, swanky and should easily accommodate NHC Tour players in the tri-state area looking to qualify for Vegas early in the 2016 calendar. Meadowlands Racing and Entertainment, according to Ryan, is hopeful that months of in-house advertising to core on-track customers, plus press releases, social media and placement on the NHC Tour website could yield 200 entries this Saturday -- potentially a key determinant to whether the Meadowlands eventually dips back into the NHC pool. A lot is at stake for the Big M this Saturday, as I see it. According to my sources, the cost to host an NHC qualifier is steep for brick-and-mortar or Internet-based venues outside the National Thoroughbred Racing Association (NTRA runs the NHC) and who pay double the roughly $4,000 per NHC "seat" cost to NTRA members (e.g. Monmouth Park). "If we have a strong player turnout and a big handle figure on Saturday, I am positive we will make the NHC qualifier an annual event," said Ryan. As I see it, with no cap on number of entries per player, reaching 200 should be no problem if NHC Tour members with deeper pockets come out in droves and fork over, say, $2,000 on 5 entries. The question then becomes whether lower-budget scrubs like me know about the Big M's fresh bid as an NHC qualifying hub, or if the $400 price point, absence of airfare as part of the package and/or selection of contest tracks are potential deterrents. Admittedly, I was on the fence at first, if for no other reasons than the price is a bit outside my comfort zone and my lack of familiarity with the Fair Grounds and Oaklawn circuits; to be sure, I generally avoided playing those tracks (save for the mandatory contest races) at NHC 17. However, I intend to make the trip north on Saturday and reinvest my Vegas side-bet winnings for a shot to return to Las Vegas for a third-straight season and a potentially sizeable cash prize pool, and hope the turnout is strong enough to add more live qualifiers in the New Jersey market and increase interest in the NHC Tour.